No one does spectacle quite like the Americans. Who else would take simple fiddle tunes, the kind of stuff that seems most at home barefoot on the back porch, and surround ‘em with so many musicians it takes an entire page to list them all? And yet it works –A Fiddler’s Holiday is both exquisitely tasteful and extravagantly lavish, and deeply moving despite some rather obvious tugging on the heartstrings. Jay Ungar gained fame when his “Ashoken Farewell,” a bittersweet fiddle instrumental that sounds exactly like homesickness feels, became the recurrent theme music on Ken Burns’ PBS Series on the Civil War. While not a seasonal piece, it’s here, of course (one doubts Ungar is able to get through a concert without it – as a tune that could as easily be the theme music for ‘Americana’ itself, it’s become a profoundly beloved composition). 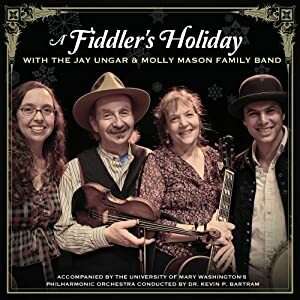 In this case it’s given a straightforward performance by the family - Jay and Molly, Jay’s daughter Ruthy, and her husband Mike Merenda , with just two fiddles, guitar, and banjo – that fully accentuates the tune’s simple, yearning beauty. Other originals include Molly’s “The Snowstorm,” Ruthy’s “Darkest Days, Brightest Nights,” and Jay’s “Lights Of Chanukah,” a tune he wrote for Ruthy when she was a child. The rest of the material is primarily traditional, arranged by Jay and Molly. There’s bluegrass (a keening “A Rovin’ On A Winter’s Night”) and old-time Appalachia (the sprightly “Christmas Eve”), along with a waltz medley that combines a melody from Quebec (“Waltz Of The Little Girls”) and France (“Waltz Of The Toys”) into a gently gorgeous tune here called, naturally enough, “Waltz Of The Little Girl’s Toys.” Bringing the celebration to a close is a soft and genuinely moving rendition of “Silent Night” that morphs into the Cajun-spiced “Silent Night Two Step” to end on an exuberantly upbeat note. Ungar and Mason, who also co-wrote a couple of tunes, share co-arranger credits on the traditional material, deftly handling the orchestral contributions with admirable restraint – enhancing but never overwhelming nor descending into the saccharine sweetness endemic to holiday music. The University Of Mary Washington Philharmonic Orchestra, conducted by Dr. Kevin P. Bartram, seem quite at home with the fare. It’s a large ensemble indeed, but they’re surprisingly supple and responsive, with an agreeably loose feel in keeping with the music’s informal essence. Yes, there’s a sense of spectacle – without any background info, few would mistake this for anything but a PBS special, the kind that takes a tuxedo-clad audience on a soft-seater tour of America’s back roads and back porches. Each tune gets a brief introduction encapsulating its history, but it never gets too dry or ‘good for you’ educational. And Jay and Molly, their family and their friends, remain firmly rooted in the folk tradition, earthy and honest, and their offhand charm helps ensure that proceedings remain joyous rather than ponderous. All in all a lovely holiday outing that’s quite different than the usual standards collection, A Fiddler’s Holiday is lovingly performed and thoroughly engaging, and there’s some genuinely breathtakingly beautiful fiddle work. Very nice, and highly recommended!